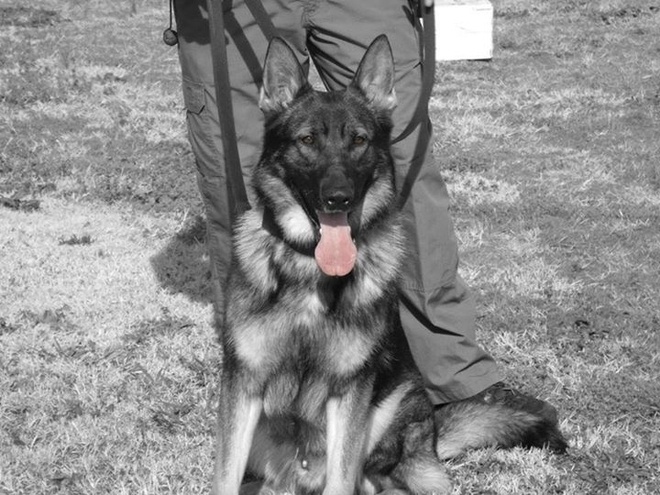 To this day, Hyco is still being honored and remembered in many ways including the proposed Hyco’s and Fargo’s Law, which was named to honor both Deputy Brandon Surratt’s K-9 partner Hyco, and Richland County Sheriff’s Corporal Warran Cavanaugh’s K-9 partner, Fargo, who was shot and killed in the line of duty December 16, 2011. The bill passed the South Carolina Senate in February 2017 and was awaiting the next step, but unfortunately failed to pass the House before adjournment for summer 2018 break. Deputy Surratt, formerly with the Anderson County Sheriff’s Office now with Greenville County Sheriff’s Office K-9 Unit and Senior Corporal Warren Cavanagh with the K-9 Unit of the Richland County Sheriff’s Department will be starting their fight again this November as Fargo’s and Hyco’s Law is re-introduced by Representative Neal Collins, who has been a big supporter of this bill from its conception. Representative Collins will be reintroducing it to the Senate fall of 2018. The bill would increase the potential maximum sentence for killing a police K-9 from five years to ten years and the potential fine amount from $5,000 to $10,000. Sentencing will remain as it is now, up to each individual judge on a case per case basis. These K9s are not just a tool or a toy. They are a partner. The time, dedication and training that goes into these dogs is like no other. These K-9s do things that the handlers and other officers can’t. More times than not these K-9s are why their handlers make it home after every shift. These working dogs deserve the stiffer penalties that this law will bring. This law is not for Hyco or for Fargo. It’s for all the working K-9s that are still in the fight. If Hyco’s Law were in effect when Hyco’s killer was sentenced, it would have added five years to his sentence. Hyco’s killer is currently still in prison only because of to the two attempted murder charges for the attempt on Hyco’s partner Brandon Surratt’s life along with another ACSO Deputy, not because he killed Hyco. The biggest hurdle this bill faces in the House is a lack of understanding about what police K-9s do and a valuable asset they are for every law enforcement agency. K9s cost near 15K just to acquire. These special breed K9s are acquired from an approved breeder located in Europe. The dogs are brought to the US and then sent to training centers across the US. At the training center the dogs begin their police K9 training and then paired up with their human partners and continue a training program with their partners prior to going to the perspective units. This training is an additional cost, as well as the travel and housing expenses incurred during this time. All of these expenses are incurred prior to the K9 even stepping foot in their new department. just to mention of few of the costs involved upfront. Then there are ongoing fees such as special diets, grooming bills, vet health bills and dental bills. If you want to help us get this bill passed and have it become law please contact your representatives and senators, you can call them, email them, send letters. To find your state legislators and their contact information, log onto the S.C. State House website at – www.scstatehouse.gov/legislatorssearch.php.